Environmental Fluid Mechanics (EFM) studies the motion of air and water at several different scales, the fate and transport of species carried along by these fluids, and the interactions among those flows and geological, biological, and engineered systems. EFM emerged some decades ago as a response to the need for tools to study problems of flow and transport in rivers, estuaries, lakes, groundwater and the atmosphere; it is a topic of increasing importance for decision makers, engineers, and researchers alike. The second edition of the successful textbook "Fluid Mechanics of Environmental Interfaces" is still aimed at providing a comprehensive overview of fluid mechanical processes occurring at the different interfaces existing in the realm of EFM, such as the air-water interface, the air-land interface, the water-sediment interface, the surface water-groundwater interface, the water-vegetation interface, and the water-biological systems interface. Across any of these interfaces mass, momentum, and heat are exchanged through different fluid mechanical processes over various spatial and temporal scales. 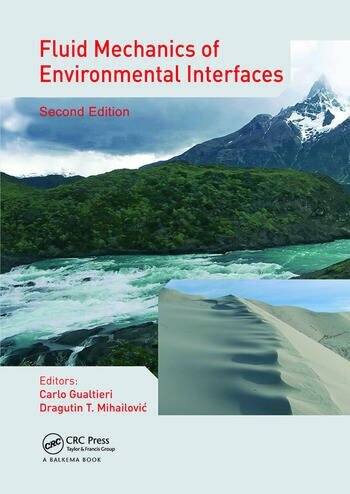 In this second edition, the unique feature of this book, considering all the topics from the point of view of the concept of environmental interface, was maintained while the chapters were updated and five new chapters have been added to significantly enlarge the coverage of the subject area. The book starts with a chapter introducing the concept of EFM and its scope, scales, processes and systems. Then, the book is structured in three parts with fifteen chapters. Part one, which is composed of four chapters, covers the processes occurring at the interfaces between the atmosphere and the surface of the land and the seas, including the transport of dust and the dispersion of passive substances within the atmosphere. Part two deals in five chapters with the fluid mechanics at the air-water interface at small scales and sediment-water interface, including the advective diffusion of air bubbles, the hyporheic exchange and the tidal bores. Finally, part three discusses in six chapters the processes at the interfaces between fluids and biotic systems, such as transport processes in the soil-vegetation-lower atmosphere system, turbulence and wind above and within the forest canopy, flow and mass transport in vegetated open channels, transport processes to and from benthic plants and animals and coupling between interacting environmental interfaces. Each chapter has an educational part, which is structured in four sections: a synopsis of the chapter, a list of keywords that the reader should have encountered in the chapter, a list of questions and a list of unsolved problems related to the topics covered by the chapter. The book will be of interest to graduate students and researchers in environmental sciences, civil engineering and environmental engineering, (geo)physics, atmospheric science, meteorology, limnology, oceanography, and applied mathematics. Carlo Gualtieri is currently Assistant Professor in Environmental Hydraulics at the Hydraulic, Geotechnical and Environmental Engineering Department (DIGA) of the University of Napoli Federico II. He received a B.Sc. in Hydraulic Engineering at the University of Napoli Federico II, where he also received a M.Sc. in Environmental Engineering and a Ph.D. in Environmental Engineering. Prof. Gualtieri published 102 peer reviewed scientific papers, including 25 publications in scientific journals, 53 papers in conference proceedings, and 24 other refereed publications in subjects related to environmental hydraulics and computational environmental fluid mechanics, with over 80 papers, experimental investigations of two-phase flows, water supply networks management and environmental risk. He is co-author of 2 textbooks on Hydraulics and author of a textbook on Environmental Hydraulics. He co-edited the books Fluid Mechanics of Environmental Interfaces (Taylor & Francis, 2008) and Advances in Environmental Fluid Mechanics (World Scientific, 2010). Since 2006 he is a member of the Editorial Board of Environmental Modelling and Software (Elsevier) and since 2008 of Environmental Fluid Mechanics (Springer). He contributed as reviewer to several scientific journals (e.g. Environmental Fluid Mechanics, Environmental Modeling and Software, Journal of Environmental Engineering ASCE, Journal of Hydraulic Engineering ASCE, Journal of Hydraulic Research, Experiments in Fluids, Advances in Water Resources, Water Resources Research, etc.) and as external examiner for Ph.D. thesis in foreign countries. He is co-organizer of the Environmental Fluid Mechanics session at the International Environmental Modelling & Software Society (iEMSs) biennial conferences since 2004. He is also active as expert reviewer for research funding agencies in several countries. He is member of the International Association for Hydro-Environment Engineering and Research (IAHR) and of the iEMSs. Dragutin T. Mihailovic is Professor of Meteorology and Biophysics at the Department of Vegetable and Crops, Faculty of Agriculture, University of Novi Sad, Serbia. He is also Professor of Modelling Physical Processes at the Department of Physics, Faculty of Sciences at the same university and Visiting Professor at the State University of New York at Albany, NY (USA). He teaches various theoretical and numerical meteorology courses to Physics and Agriculture students. He received a B.Sc. in Physics at the University of Belgrade, Serbia, his M.Sc. in Dynamic Meteorology at the University of Belgrade and defended his Ph.D. Thesis in Dynamic Meteorology at the University of Belgrade. He is head of the Center for Meteorology and Environmental Modelling (CMEM) which is the part of the Association of Centers for Multidisciplinary and Interdisciplinary Studies (ACIMSI) of the University of Novi Sad where he has teaching activities. He is also head of the Center for Meteorology and Environmental Predictions, Department of Physics, Faculty of Sciences, University of Novi Sad. His main research interests are the surface processes and boundary layer meteorology with application to air pollution modelling and agriculture. Recently, he has developed an interest for (i) analysis of occurrence of the deterministic chaos at environmental interfaces and (ii) modeling the complex biophysical systems using the category theory and nonlinear dynamics. He has over 60 articles in international peer-reviewed journals; 405 citations in SCI journals; edited 4 books (Taylor & Francis, World Scientific, Nova Science Publishers); 15 invited lectures in worldwide institutions and universities and 4 plenary talks. "After reading this book, I rate it to be an extremely useful tool to keep on a bookshelf, both for occasional checks for concepts or data and as study and reading material for graduate and postgraduate researchers. The editors and the authors are to be commended for their effort to create a conceptual order and study path in the vast thematic area of fluid processes at environmental interfaces." "Overall, the text is an excellent treatment of the fluid mechanics of interfaces within the hydrosphere and the atmosphere. The monograph reads well as a cohesive text, providing insight to the student and the scholar. The book will make an excellent addition to the student’s or the researcher’s library. I look forward to applying the text the next time I teach environmental fluid mechanics; it will significantly improve my treatment of exchange at all boundaries of fluid flows."